What happens when two similarly branded companies founded by students, each taking a different spin on traditionally blue-collar services, move in together? Did you guess state-of-the-art technology, integrated work-study stations, a full kitchen featuring a juice and coffee bar, golf practice range, X-Box gaming area, chalkboard covered walls, and the full functionality of an office for two of the fastest growing moving and cleaning companies in Gainesville, FL and in the state of Florida?! We are proud to announce that we have actually moved ourselves, as well as our friends over at Student Maid, into a brand new, completely remodeled office for the 2015 moving season! Moving in with another like-minded company has created a culture coined as “Gainesville’s Google of the service industry”. 2 College Brothers, Inc , as well as new office mate Student Maid, only hires current students and graduates. By hiring intelligent and motivated employees, and being surrounded by others with the same motivations, we are able to offer a moving experience second to none in an industry populated by traditional movers. The energy we feel when we step foot into the office each morning is filled with fast flowing ideas: anything from creative marketing approaches and unique scheduling applications to more comprehensive training methods and sustainable growth strategies. Maid Suite, a scheduling app developed by Kristen Hadeed, Student Maid’s founder, reduces scheduling time from ten hours to ten minutes. 2 College Brothers has also developed a scheduling system that allows movers to see all jobs on a cloud-based calendar and then actually pick which ones they are able to work based on their class and social schedules. Both methods eliminate the headaches and conflicts so often experienced by our competitors. The result? Movers on time and eager to work without the confusion otherwise brought on by traditional scheduling techniques, thereby ensuring a smooth start to every client’s new home transition. Having other entrepreneurs and managers down the hall allows us to bounce new ideas off one another and share solutions to the problems that every business faces. We are now able to feed off one another and support each other when times get tough. There is also an element of fun in the air. Birthday and holiday parties, office competitions, and spontaneous acts of silliness create such an enjoyable climate that many of our employees actually come to the office when they aren’t working! Employee happiness creates client happiness, and client happiness is what has allowed us to explode in growth over the past five years! Both companies previously incubated at the Santa Fe Center for Economic and Innovative Development, or CIED. The CIED is an area for start-ups to establish systems and drum up business when resources and capital are otherwise scarce. A Gainesville moving company and cleaning business would sound like unlikely inhabitants in such an environment typically dominated by tech-based firms; however, the founders had big plans: plans to revolutionize an industry! Student Maid moved out of the CIED four years ago. Five hundred employees and two locations later, they were ready for an upgrade from their previous seven hundred square foot office. Student Maid approached our moving company about the possibility of sharing a cooperative mega space at the beginning of 2014 while we were still at the CIED. Our moving company was just then starting to outgrow the CIED, unaware of the breakthrough summer that lay ahead (where we more than tripled in sales from the previous year). Back and forth negotiations between the moving and cleaning companies, as well as landlords and contractors, delayed the move-in until the start of 2015. Agreements were reached, and now the companies share the incredible four thousand square foot space both had only dreamt about just a year before. Even though we were still able to operate as one of the highest quality moving companies in the state of Florida in our previous work environment, we were stifling our growth potential by not having private space, storage, or 24/7 building access, and we were only able to offer a limited number of cultural benefits to our employees. Now we have it all! The new space allows us to take our moving company to different heights. With eight private offices, an open shared work-study space, a conference room connected with Apple TV, lounge area equipped with X-Box, a full kitchen and cooking area, dining area, storage rooms, washer and dryer, coffee bar, backyard with practice golf range, dumping access, and a five minute tour to the interstate, we will be fully prepared for our biggest moving season ever this summer! As our Gainesville moving company continues to grow locally, we have begun to seek out options for growth into other markets. Our short-term goal is to open a second location by inserting our model into a big city. Once proven successful, we hope to use it as proof to prospective franchisees that it can work in two completely different markets. 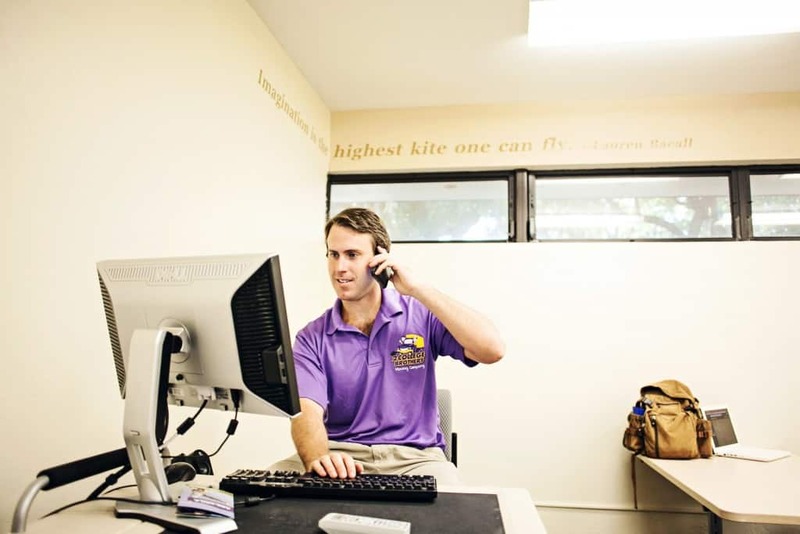 The office in Gainesville would serve as a call center for each location, as well as a call center for future franchises! Down the road, we want our Gainesville moving company to serve as a cultural hub and corporate headquarters for a national franchise organization attracting several types of jobs and talented people from across the country! We envision a place where we can try out different cultural ideologies as well as new products or services. It is said that when Mark Cuban bought the struggling Dallas Mavericks, he outfitted the arena with state-of-the-art locker rooms and other amenities, purchased a private jet for the team to travel on, and made sure they had the coolest “swag” to take with them. Shortly thereafter, they won a national championship! Not to say we will be supplying our movers with a private jet any time soon, but there is something to say for improving working conditions and how it relates to performance. Being next to an innovative and acclaimed company like Student Maid will no doubt increase our positive energy and enthusiasm in the workplace, and having comfortable and outstanding facilities in this collegiate-minded atmosphere will also exponentially magnify this response! This program is designed to mold interested management candidates into company leaders as we enter our busy season. We currently have six members in the group and meet Sunday evenings. We are getting into the box business baby! This summer we will begin to sell boxes as add-ons to moves, offering free delivery before the move and free recycling pick-up afterwards. Last summer was our first run at offering storage. We have worked out the kinks, and our new office location has allowed us to establish a partnership with a much closer location! Moving into a new office has allowed us to become more organized, and in doing so, we can improve client demographics and optimize feedback data. Ultimately, this helps us build a better Gainesville moving company! So there you have it! A virtual look into our new office with another amazing company. Curious as to what it actually looks like? Stay tuned for an announcement of our OFFICIAL ribbon cutting coming a bit closer to moving season when you can get the inside scoop on “Gainesville’s Google of the service industry”!